One of the things I am more in tune with is when I am out of alignment. What does that even mean…to be in alignment? For me it shows up as less energy, and more lethargic, things are whirling about on so many things and not able to calm my mind, feeling so off kilter like I’m walking leaning to one side (this comes over me when I cant’t find my center or I’m not even aware that I’m off center). This is what it looks like in my body. How it presents itself is me not being able to keep my mind on any one task, both personally and in business to actually get them completed. Wanting to sit and binge watch something….anything (I know I’m way out of whack when I don’t even have a preference for a show) so I don’t have to think about any one thing. My out of alignment can also show up in my interactions with my family or when I avoid talking with friends in case they call me out on it. When I’m out of alignment my world is different, my brain is foggy. What I’m encountering in my daily life seems bigger than it actually is and I’m no longer in tune with my inner being, my intuition. You know what my biggest clue is…I haven’t gone outside in 2 or 3 days (because I work from home sometimes it’s not so apparent) or when no real work is getting done and, again, it’s the 3rd day of nothingness. When you are out of alignment what do you do to get back in, to find your center once again? What feeds your soul at times like these? What’s that one thing (or 2) that tips you back upright and functional again? That clears away the cobwebs so you can breath more easily? Do you ask for help? Schedule in some much needed sleep? Stop being the Doer of all things? Create space for your mind to take a breather? But When I realize I’m sooo outta whack, darlin, its time to pick up my journal and write. I write without thinking about the words I’m getting down. I write to tap into that space that holds all the answers. And, as I write, some one thing begins to rise to the surface like clouds suddenly shifting to make way for a beautiful blue sky. It’s only then that I realize that that one thing fits what I’ve been going through. And, every single time, THE thing that was was buried deep that I didn’t even notice was there (yeh THAT!) …..it shows up. The minute I write that one sentence and it dawns on me what’s coming up, I am so surprised. Know why…cause usually it’s something I thought I had previously dealt with (big no on that right?). This is what journaling does for me. It gets me out of my head and into my heart so the words can flow unimpeded and reveal my truth. if you’re feeling out of alignment, here’s a list of questions you can ask yourself in your journal . . .
► Am I out of integrity with the choices I’ve been making of late or with my own values & beliefs? If so…how? ► Am I saying yes when what I really want to say is No to something, someone or an event? ► In what ways have I not been taking care of myself.. my body (usually the first thing we slack on), my mind, the soul center part of me? ► Are there people in my “front row” who are not serving me, not supporting me, not showing up for me? ► Have I stopped giving myself permission to just show up as me? Answering one or more of these questions will give you insight into where you’re out of alignment. 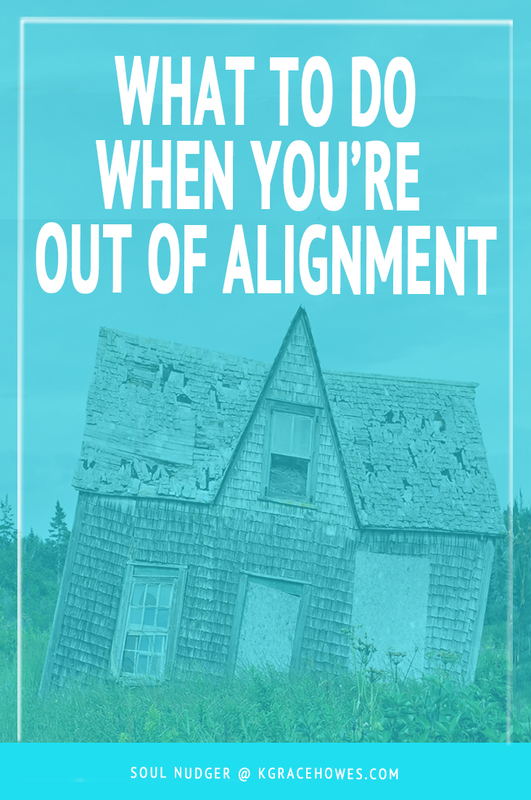 If you find that you are so far out of alignment that nothing is working I can help. As a Mindset Coach I’ll help you shift things enough to get clarity around a particular situation, help you find out where things should change, help you get more clear and closer to the thing that’s calling on you to show up. Right now I’m gifting 50 —90 minute sessions to women who are more than ready to shift something in their lives and needs some support along the way. In 30 days I want to book 50 powerful conversations with women who want to make a deeper connection with themselves and are ready to get out of their own way. Women who want to show up in a more powerful way in their lives AND in the world. If this is YOU, fill in the form below to get started. Know that these calls are on an application only basis, so I can be sure you are ready to do the work required. Is it time yet to begin to show up for you? UPDATE: The Challenge is over but I now have 10 spots open every month for you to book a 90 min Complimentary Call with me. Start your journey to you by filling in the form below.